I'm Joy-I Scrap-I'm Happy: Dreams Are Coming True! I often reference Studio Tangie, Tangie Baxter and the Art Journal Caravan. Well I am thrilled to share with you that Tangie is planning on opening a brick & mortar studio! 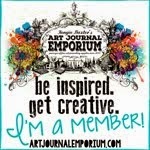 With the studio she will teach art journaling to kids and adults alike. She will also have the space she needs to record more online workshops...yay! "This is one of those days that I will FOREVER look back on as one of the most amazing, incredible, memorable ever. This is the day that dreams are coming true. I am so beyond ecstatic to let you know that I'm opening a STUDIO here in Mesa, Arizona! A real classroom and workshop destination location! The really exciting part is that everyone can be a part of it! I'm launching a KICKSTARTER campaign today with some AMAZING AWARDS including a backer's only blog where you will get to be part of the Studio progress every step of the way! How cool is that? There are also collage sheets, workshops, online classes, original paintings, journals and so much more!" Joy here again. The kickstarter concept is that many hands make light work. For as little as a $2 pledge you can help Tangie's start her studio. Imagine the people she'll inspire to create! But the pledge is not a donation, you will receive something in return. She has really cool rewards set up to send all her backers. Some levels even include orginal artwork! Tangie is a wonderful and giving artist and I hope you will visit her kickstarter page and consider helping. Thanks!